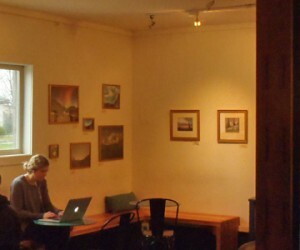 Home » Blog » Extreme Plein Air Art Reception at Evans Brothers Coffee April 20! Extreme Plein Air Art Reception at Evans Brothers Coffee April 20! Evans Brothers’ Coffee will be the venue April 20 for an artist’s reception for some of the FSPW “Extreme Plein Air” artists, including painters Ed Robinson and Aaron Johnson and photographers Joe Foster and Marjolein Groot Nibbelink. Their work — much of which will be for sale — will be hanging in the gallery at Evans Brothers from early April until mid-May. The images on display will all be of the Scotchman Peaks interior and gathered on one of the extended back-packing trip FSPW invites artists to participate each summer. Meet the artists (and the hike leader) beginning at 5:30. Preview the art any time before then. It will be on the walls until May 10. Don’t tarry. Some is already sold! No host bar and (of course) coffee galore will be on hand. A portion of the coffee proceeds will be donated to FSPW. Light appetizers also provided.